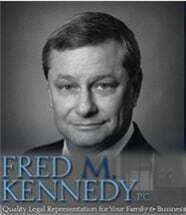 Since 1977, Fred Kennedy and his law firm, Fred M. Kennedy, P.C., have provided legal advice in many areas of law to individuals and businesses in the Augusta, Georgia, area. When you are a client of our law firm, we may be the only law firm you will ever need. We represent those with family law needs as well as provide representation in estate planning and probate and personal injury litigation for accidental injuries and medical malpractice. We also assist with collections on behalf of the claimant (the one who is owed money).Attorney Fred Kennedy is a Georgia-born, Georgia-educated family law and business law professional with a reputation for getting results for clients in Augusta, Martinez, Evans and other cities within the Central Savannah River area of Richmond County, Columbia County and Burke County. At Fred M. Kennedy, P.C., we listen carefully, act decisively and offer solid solutions that last. We believe in promptly returning all after-hours messages and hope to prove the words 'Personal Service, Sound Advice' to be true with every client interaction. Our law firm represents clients with any issue related to family law, including divorce, child custody determinations and disputes, child support determinations and disputes and adoption. Our probate experience extends from simple wills and trusts to will contests, proof of heirs disputes and the appointment of guardians and conservators. For those in the Augusta area who are injured in a car accident or other type of accident, we have decades to experience in civil litigation and obtaining settlements on behalf of our clients. We also represent personal injury victims of medical malpractice including failure to diagnose, misdiagnosis, brain injuries and detached retina. For our small business clients we handle the full range of business litigation issues as well as collections through garnishment, collections in pre- and post-judgment remedies and commercial collections. At Fred M. Kennedy, P.C., we provide quality legal representation for your family or business. We handle all phases of probate and estates including petition filing, notice to heirs, appointment of administrator/executor, inventory/appraisal of assets, payment of debts or taxes, sale of assets and final distributions. When you contact an attorney about a significant sum of money owed to you, you deserve the most realistic assessment possible as to your chances of success. You get that candor, confidentiality and more at our law firm. If an error by a hospital administrator, physician, surgeon, nurse or orderly has harmed you, you should speak with a Georgia medical malpractice attorney. For more than 35 years, our law firm has counseled individuals, couples and families who are going through a divorce with children involved. Divorce proceedings can take dramatic twists and turns. No matter what venue your matter is heard in, no matter what remedies are appropriate, you can be assured that our firm is in your corner during this difficult time.